In Lebanon, the concept of a fair trial is directly challenged due to the presence of several exceptional courts. Their presence creates a form of justice that is outside the scope of ordinary law, allowing for a judiciary that is separate and inexpedient,. This is embodied namely in the Military Court, the Judicial Council, the High Court of Justice, and the Personal Status courts. 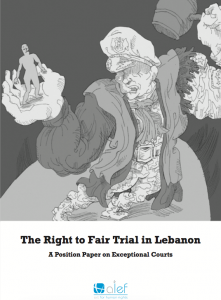 These courts, and the prevalent practices within their structures, do not adhere to international standards, and pose a direct threat to the independence of the judiciary.. Based on several cases and legal texts, this paper presents the reality of exceptional courts in Lebanon while reflecting on the principles of a fair trial. It will also give recommendations to be considered by stakeholders in order to find a solution.